Yay! Yesterday was a sunny picture taking day that was perfect for snapping photos of the Christmas mantel! It's the dark side of the room so even on sunny days it can be a challenge to photograph. Which is great, because I think it might be the best Christmas mantel I've done yet. Out of the two I've done. This year I decided to go with an elegant, rustic, modern, green and white theme with touches of red. Partly because I already had a couple Christmas pillows and I wanted to work with them to save money. And I am loving my Christmas pillows this year! But that's another post for next week. I shopped my house like a boss to get this mantel. I bought the mirror rather recently at the thrift store for $5 knowing that, whether Christmas or not, it was going over the fireplace. Since we were currently painting the new nursery and all the brushes were out and covered in paint, I taped the mirror off and gave it 3 new coats of white paint. I should have sanded it first because the previous paint job was gloppy, but I was in a hurry. Just don't look real close, mmmk? The wreath is the one purchase specifically for the mantel. I found it at Ikea for about $10. 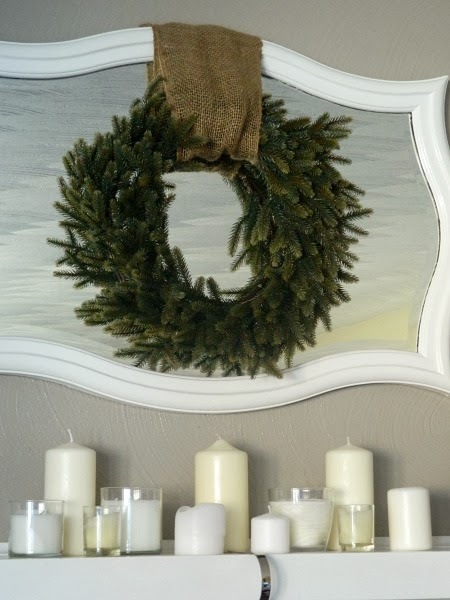 I love how wreaths look hanging on mirrors so I knew I had to go for it with the new mirror! Just a strip of burlap garland and some thumbtacks in the wall to hold it. Definitely needed Hubby's help for that one. Everything else is stuff I already had floating around. 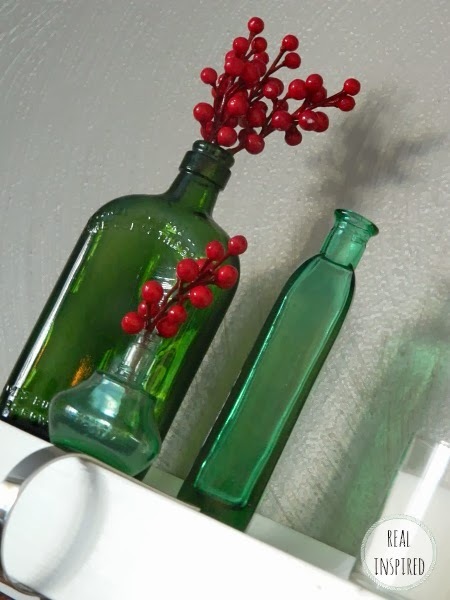 A few old green bottles, with a few berries left over from making the wreath for the front door brings in color, while all the white candles keep it light. I'm still in love with the chalkboard. I reused it from my fall mantel. Maybe my chalk art skills are improving? Ummm, not yet. I really love how it turned out! And I'm dying to light all those candles at once! I bet they'll look amazing. I love candles but I always forget to light them. Doesn't help that every candle I have has to be up high before I can light it with Little Man running around. And being cute and stuff. 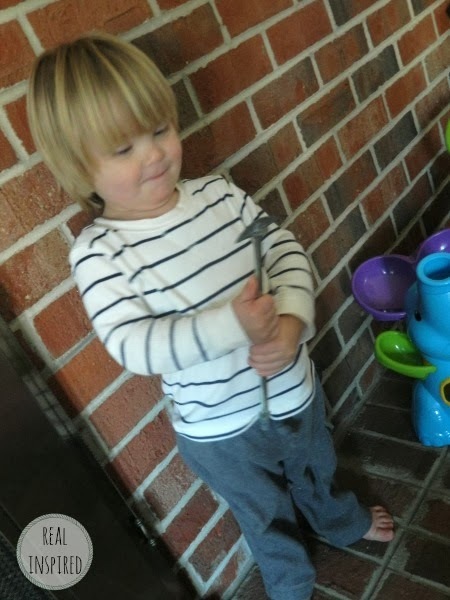 Please tell me I'm not the only mom with only blurry pictures of her kid because he won't be still for two seconds? So, the mantel looks great! When you count the mirror, I only spent $15 with the wreath. Since Christmas is usually a budget buster time, it's really great to try and reinvent things you already have for decorations. I had to gather every white candle I had and move some stuff out of their place in other rooms to put it all together. It's a skill I'm working on. I love having a mantel! Do you shop your house? 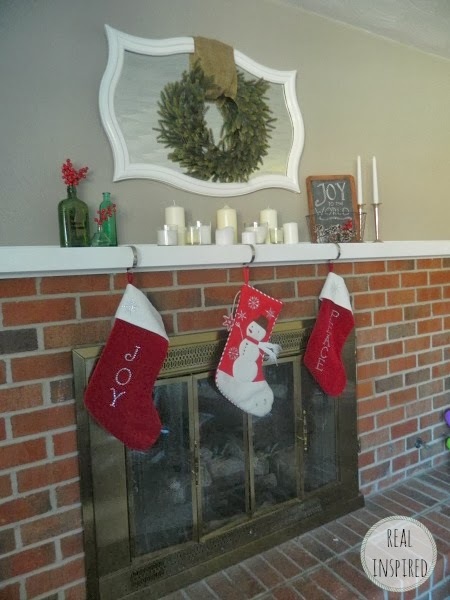 Do you have a mantel or mantel type thing that you decorate? I may be linking up to a few of these link parties. Stopping by from Love of Family and Home blog hop. 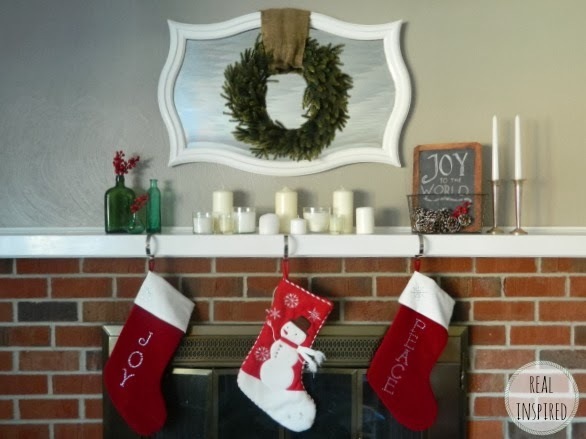 I love your simple mantel and burlap is all the rage again this year. Lovin all the chalkboard art I am seeing in blogland as well. Have a great day!